It’s most unfortunate that many people see this valuable herb as nothing more than an annoying weed, placed upon the earth purely to vex lawn purists. Dandelion, or baby sunflowers, as my youngest son would say – because not only are their flowers yellow but they open with the sun and close at night or on cloudy days – serve a far grander purpose. They’re stout, hardy herbs that can grow nearly anywhere in almost any sort of soil. What the lawn purists lament, the naturalist or survivalists laud. Every part of this plant is usable for human consumption in terms of food and herbal care (can that be said of grass?). Dandelion also serves as a wild food for animals. Yes. Gardeners, oh ye who pluck this herb religiously out of your lawns and gardens pay heed. Instead, try keeping these wonderful herbs around and watch with joy as the rabid bunnies devour the leaves of these lovelies instead of your peas. Sit back and enjoy the sight of the birds nibbling away at the ample dandelion seeds instead of plucking vegetable seeds out of your garden soil. Then, when the time is right, harvest some for yourself. Uses: Flowers – the late Ray Bradbury was fond of one of the best uses of dandelion flowers, dandelion wine! The flowers also make a colorful addition to salads and fresh cut vegetable dishes. They’re also considered an antioxidant. Leaves – tender young leaves make a nutritional addition to salads and are rich in vitamins A, B complex, C and D. As well as minerals zinc, potassium and iron. The leaves are traditionally used as a diuretic, to stimulate digestion and support healthy kidney function. Roots – are used as a coffee substitute and to cleanse the liver and gallbladder. Dandelion in general has been used for assorted ails such as: boils, sores, skin eruptions, breast issues, fever, indigestion and diarrhea. All things considered, I’d rather fill my property with these tenacious gems than an expanse of snickety grass that’s expensive to maintain and relatively useless. Instead of struggling to keep the lawn neat, I can kick back and give a toast of dandelion wine to one of the greatest writers to grace the page and watch wildlife abound around me. What a nice post. Once upon a time I actually made some Dandelion Wine. A friend mailed me a coffee can full of dandelions from Aspen. It made a delicious, sweet wine. 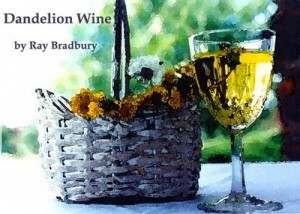 Obviously I’ve been a Ray Bradbury fan since childhood & loved reading Dandelion Wine.